I'm starting this thread to people share screenshots of their Adi setup or something related. 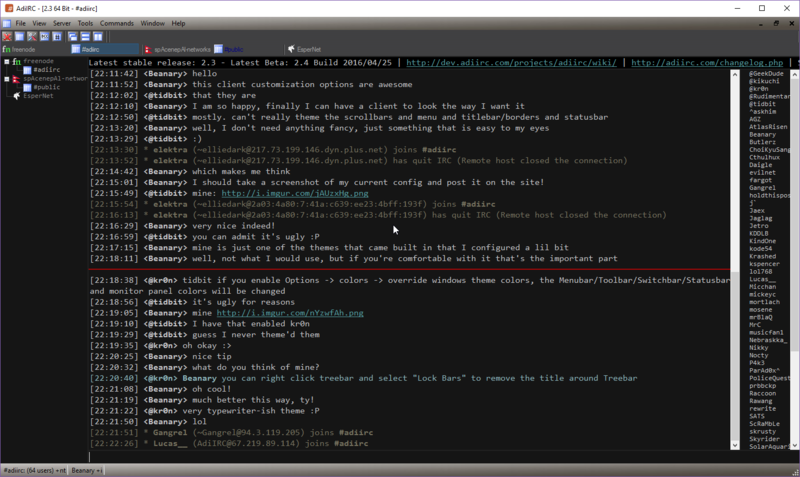 To take screenshots, I suggest the fantastic ShareX if you are on Windows platform. Nothing special in this setup, just custom treebar icons, a pattern bg image on menubar to clone mIRC style, a custom toolbar button to check for updates (/betaup) and tiny colors changes in default Adi theme. Added a sticky icon for panels to toggle pinned and to works flawless with F2 keybind. With nicklist as a panel it is easy to dock together to any other panel, fits very well to treebar as suggested in video above. Also for who was wanting topicbox aligned to editbox (same width) and not above nicklist now this is possible. Panels (DCC? hmm Rawlog?!) on top of treebar? Want a priority channel above all others? A specific network always on top? No limit, it is you on control. Options -> Windows -> Window Order, you can type full window name to sort how you desire. Another cool setup by AdiIRC user.. Someone interested in a Twitch theme? Yes! I've been fiddeling with the application for hours, but I can't for the life of me figure everything out. Can't get the icon bar to extend to bigger icons, and I don't understand how user images etc can be replaced. Color entire line based on random nick colors. Ignore timestamp for consecutive messages from same user. I believe it will be very appreciated, specially by loyal AdiIRC users. My current theme. Very happy I could get something I like easily starting from one of the already included themes. Theme based on a really old portuguese script called Hybrid. Taskbar icon progress bar for dcc transfers. New themes package to export/import. 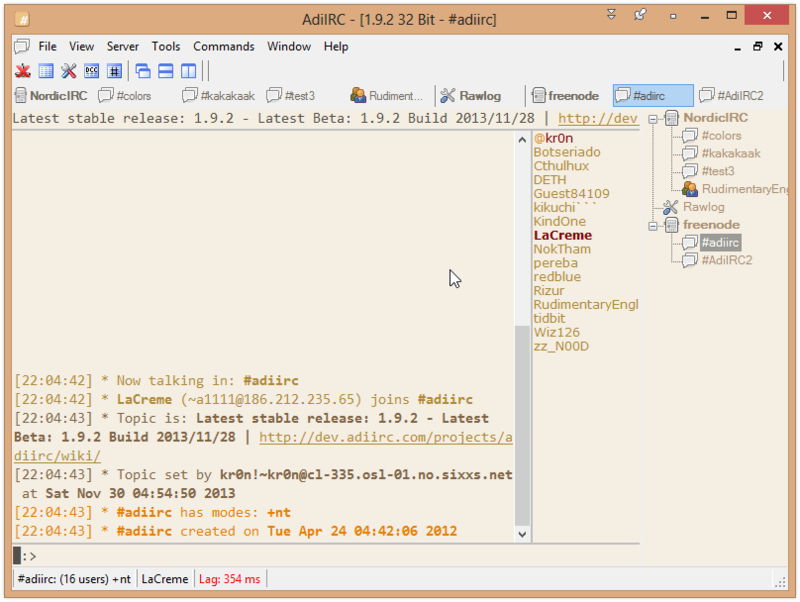 Now what you see in screenshots is possible to replicate in other AdiIRC easily. Help button in /options window to open online help for the active section. Also F1 hotkey for the same action. 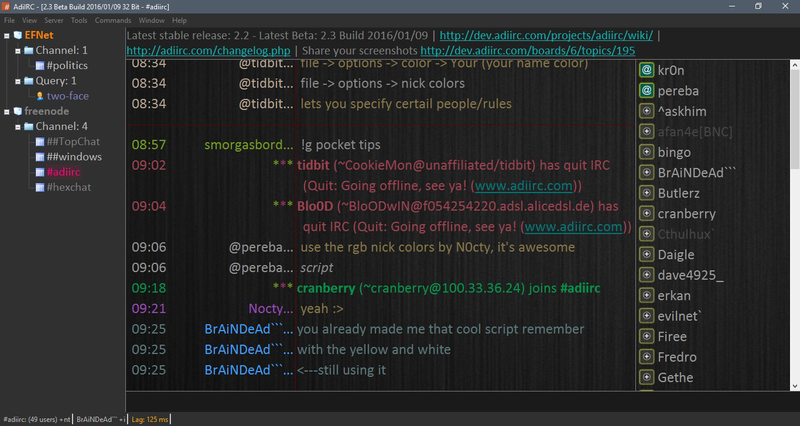 ASCII char 4 to add inline rgb colors to chat, a standard proposed by Visual IRC client many years ago now followed by AdiIRC. 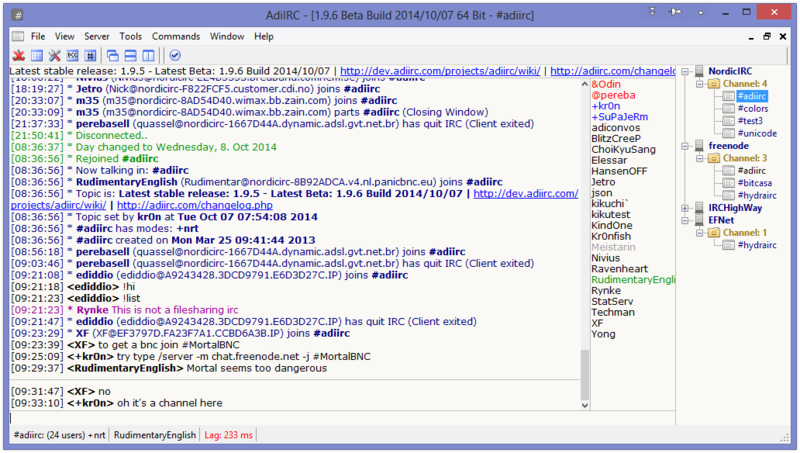 Also supported by IRCCloud (at least to parse colors). Note: AdiIRC already had support for RGB colors input through the special char 61442 as explained in Wiki Formatting_text. Char 4 makes it a little more simple to use. Someone asked me how I added the line border between messages in my Textual theme. 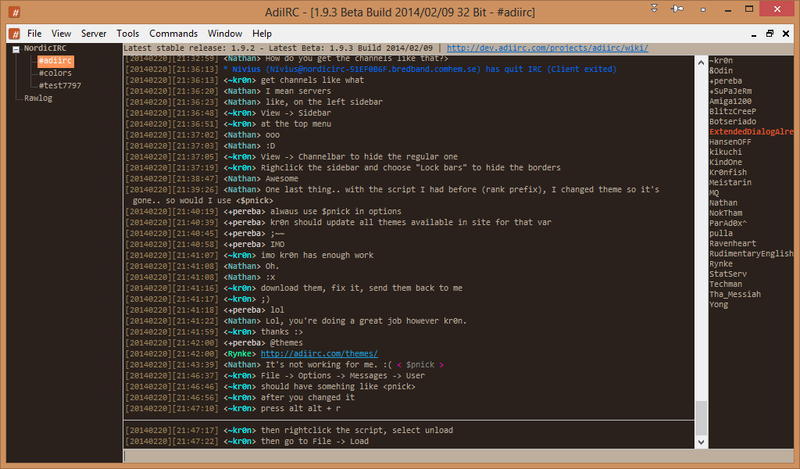 It seems a background image, but in reality it is a native AdiIRC feature, not mentioned in changelog. 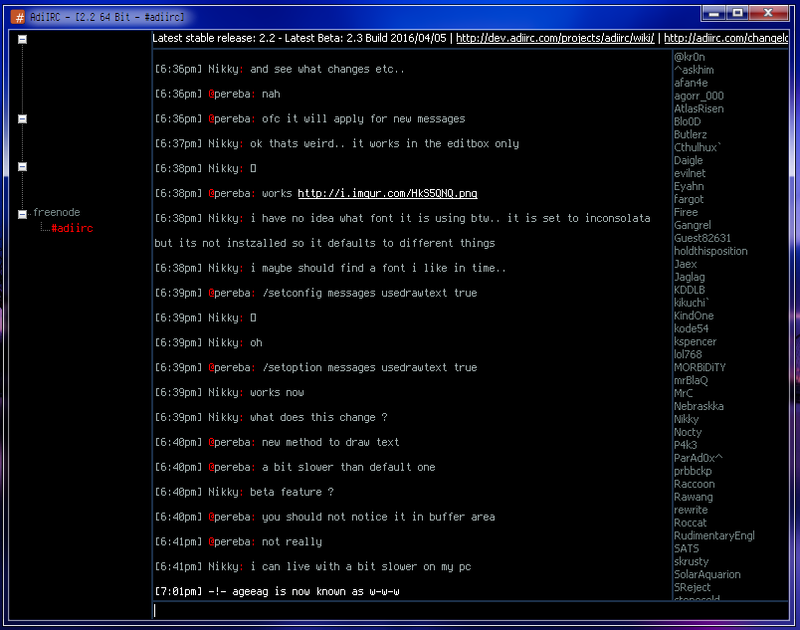 And the color you can change in Options -> Colors -> Messages -> Lines color. Both screenshots above have a background image, difference is that in second one the bg image used has the same color as the draw line, turning it "invisible" in nick column part. 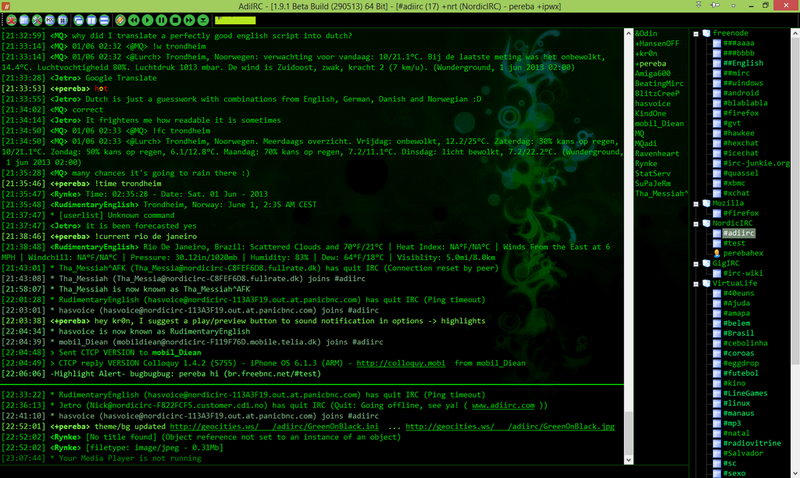 Attached is the Mibbit test theme from screenshot, before someone request that.